U.S. Secretary of Defense Ash Carter was in Afghanistan on Tuesday, just three days after international leaders agreed to support the war-torn country with about 12,000 NATO troops and funding for Afghan National Defense and Security Forces through 2020. Carter met with President Ashraf Ghani and General Mick Nicholson, commander of U.S. and international forces in Afghanistan. He also was to thank U.S. troops for their efforts toward stabilizing Afghanistan and preventing the country from again becoming a safe haven for terrorists who wish to launch attacks against the U.S. The Afghans have several problems to resolve. While there have not been major military defeats by the Taliban, the ANDSF has seen rising casualties, especially in places like Helmand province, where the Taliban is entrenched. “The Afghan Air Force is having problems in growing, the Afghan police is not doing well and you are watching the economy reach a crisis point,” Anthony Cordesman, the Burke Chair in Strategy for the Center for Strategic and International Studies, told VOA. 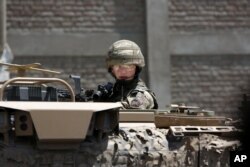 Last week, President Barack Obama announced that he was slowing the withdrawal of U.S. troops from Afghanistan. Instead of drawing down to 5,500 troops by the end of the year, 8,400 U.S. troops will remain in Afghanistan through the end of Obama’s presidency in January 2017. On Saturday, General Curtis Scaparrotti, NATO’s Supreme Allied Commander Europe, confirmed that 6,700 U.S. troops would serve in the NATO-led Resolute Support Mission to train, advise and assist the ANDSF and Afghan police. A senior defense official, speaking Tuesday to VOA, said not all of the 6,700 will count toward the total U.S. troop number in Afghanistan because they will be supporting the NATO mission from bases elsewhere in the region. More than 2,000 of the 8,400 U.S. troops in Afghanistan will support the U.S. counterterrorism mission, dubbed Freedom’s Sentinel, which targets remnants of al-Qaida and pockets of Islamic State fighters trying to establish a foothold in the country’s east. Some of the U.S. troops in Afghanistan will serve both missions as opportunities arise, senior administration officials said Saturday. A FILE - US airman guides a US Air Force MQ-9 Reaper drone as it taxis to the runway at Kandahar Airfield, Afghanistan. 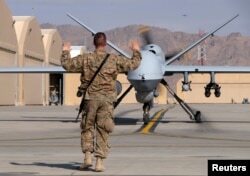 Tuesday, the U.S. military confirmed a drone strike in eastern Nangarhar province of Afghanistan but would not discuss reports that a prominent Pakistani militant commander had been killed. "We can confirm that U.S. forces conducted a counterterrorism strike in Achin and Kot districts in Nangarhar province July 9. However, for operational security reasons we do not discuss details of counterterror operations," a spokesman told VOA. Pakistani and Afghan media quoted unnamed security sources as saying that militant leader Omar Naray, who was wanted for plotting the killing of 134 students of Army Public School in Peshawar in December 2014, was killed in the strike.